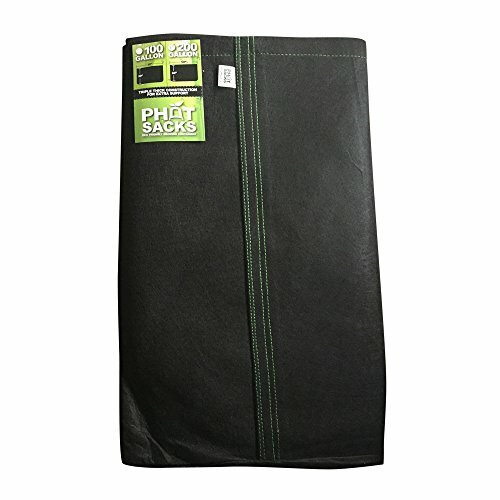 Phat Sacks XL environmentally friendly fabric grow pots are the preferred container of professional growers for their superior aeration and drainage qualities. The breathable felt construction also reduces heat buildup in the grow medium and encourages air-pruning, an effect created when roots come into contact with air. The air-pruning effect prevents root binding and stimulates branching/development of a finer root mass, which translates to higher yields. Better roots mean bigger fruits! Phat Sacks XL sizes feature extra-rugged construction with triple-thick fabric and reinforced double-stitching to better support heavy loads. Phat Sacks are proven to encourage better growth and yields than typical plastic containers! We highly recommend giving Phat Sacks a try, even if only for one plant in your grow. The advantage will be obvious! Pot dimensions: 50" diameter x 24" high ; Please note: 200-gallon label is a trade-size. Container holds approx. 203 standard gallons max. If you have any questions about this product by HTG Supply, contact us by completing and submitting the form below. If you are looking for a specif part number, please include it with your message.